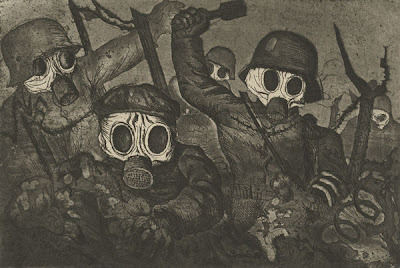 Otto Dix, Stormtroops advancing under a gas attack,1924. Otto Dix’s Der Krieg (War) cycle is not so much inspired by Goya, as the National Gallery of Victoria’s current exhibition suggests, as it is an homage to, or loving appropriation of him. As such, Dix’s sequence of etchings underscores the very form of the “cycle” itself, reminding us that Goya was witness to actions and events that humanity would (and does, and will) perform again, and again. Dix realised that it would be foolish if not impossible to update Goya, let alone the horrors of war. It does not matter from where or when Dix’s graphic and relentless (yet disbelieving) images surface, but that they do. As with all realism, they trade on wonder—the defamiliarised—rather than fact. Like Sidney Nolan’s desert corpses, Dix’s “Pferderkadaver (corpse of a horse)” is a bag of bones that seems to possess more energy than a live animal. In a last but ultimately skyward thrust, the horse charges its legs akimbo. Far from monotonous, the sequence produces great technical variety from the limitations of monochromatic plates. Matching the work’s journalistic immediacy with a skilful attention to texture, line and tone, Dix ranges over a spectrum of etching effects, from the pockmarks of aquatint to the thumbnail quality of drypoint. Indeed, the medium of etching would seem morbidly suited to his subject matter. An aquatint, Dead man in the mud uses a wash to create the leprous patches of a corpse’s skin, while the thick blanket of black in Crater field could only be achieved by ink’s opacity. With this variety, Dix’s etchings are suspended from engagement with any particular stylistic moment, so that an image like Sailors in Antwerp can reference the glaring white light and shadowed faces of Goya whilst, in the foreground, Dix lightly pens in a Cubist carafe and glasses. It’s not so surprising that the exhibition’s single image of the artist, casually hung at the exit, captures his incarnation as DADA RADIO DIX (the text scrawled on the wall beside him). For where was there left to go but the opposite direction: after all this seeing and seeing again, to recoil into the unconscious impulse of automatic process; from very deliberate evil, to chance? What else, besides gibbering idiocy, except nonsense?